This newcomer to the American car market has some history in the car business, but not like the other names that have been around for over a century. Mostly because Kia Motors is headquartered in Seoul Korea and only started selling cars in the United States in 1992. According to Kia the name comes from the Korean words Ki and A. The Ki means to come out and the “a” is from Asia. So what we have is coming out of Asia, although I have heard other meanings such as “keep it away” for one, but obviously that’s not official. The Kia car brochures and literature found here are from the U.S. and the history is not very old. Kia is the second largest automaker in South Korea with Hyundai being the largest. Incidentally at the time of this writing Hyundai owns roughly 34% of Kia Motors. Kia was formed in December 1944 as Kyungsung Precision Industry when Korea was part of Japan as a manufacturer of steel tubing and bicycle parts. Kia started making complete bicycles in 1952 and then changed the name. 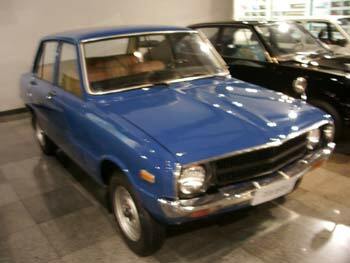 They also built Honda motorcycles in 1957 and Mazda-licensed trucks in 1962 and in 1974 Mazda cars. Sorry no early Kia car brochures, but we are always looking. Kia started building their own line of cars known as the Brisa and they assembled via licensing the Fiat 132 and the Peugeot 604. They also switched their focus from cars to small trucks until 1981 when mandatory government consolidation forced them to stop. Things got back to business in 1986 when they started building vehicles again and in 1987 they built 95,000 vehicles. Kia then entered in to a partnership with Ford and they once again became a part of the auto industry in markets other than Korea. This partnership got Kia moving again they produced the Kia Pride, which was based on Mazda 121 and the Mazda Avella, which was sold in North America and Australia as the Ford Festiva and the Ford Aspire. We are getting closer to having Kia car brochures, but not quite yet. Kia decided it was time to move in to the United States auto market and incorporated Kia Motors America in 1992. Kia actually started selling vehicles in the U.S. in 1994 through their first dealerships located in Portland Oregon. Kia expanded from Portland state by state until they had more than one hundred dealerships in thirty states by 1995. These first couple years Kia did well, racking over sales over 24,000 vehicles consisting on the Kia Sephia and the Kia Sportage and this is when the Kia car brochures started to become available. Kia experienced some financial problems over the years like so many other automakers and in 1997 Kia filed for bankruptcy protection at which time Hyundai picked up 51% of the troubled automakers stock. Over the years this has changed somewhat, but Hyundai stills own about a third of Kia Motors. Today Kia and built manufacturing plants in the United States and produces a full line of cars, vans and SUVs. Now it’s time for those Kia car brochures, catalogs and sales pamphlets that we have been talking about.